First time I caught wahoo drifting. Congrats on your first Wahoo!! Nice fish! 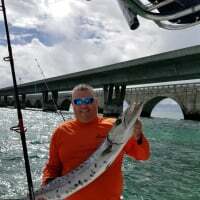 I've caught a few wahoo on the inside of the ledge on live bait. We normally add a 2-4 oz weight about 20' up the main line and bump troll or drift for kings and wahoo. It's a basic version of a poor mans down rigger. Works Great!